Milan-based animator and director Rino Stefano Tagliafierro has employed classical paintings spanning the Renaissance period to the end of the 19th century for a rather unique project that manipulates single photographs to create seemingly moving animation. Beauty was generated by importing a single frame of several masterpieces into Photoshop and splitting the various elements - people, objects and backgrounds - into separate layers. These layers were then imported into After Effects, where Tagliafiero and his assistant director Laila Sonsino generated a parallax effect by moving the different layers at different speeds. As the eye naturally perceives closer objects to be moving more quickly than those in the distance, an illusion of movement and depth to the images was produced. Essentially the brain is fooled into thinking it is looking at a 3D moving scene as opposed to a 2D static image. Although some are likely to argue that such manipulation of the classics detracts from the artist's intended effect, Tagliafierro insists his labour is a tribute to the original works. Whichever side of the fence you sit on, Beauty undeniably breathes an extra dimension of mesmeric life into these timeless master paintings. We always like it when smaller animation companies take on the big boys at the Oscars, but with Disney and Pixar to contend with, the little guys rarely get a look in for film's biggest prize. Didier Brunner, founder of Paris production house Les Armateurs, is however hoping to change all that. Although no stranger to being overshadowed by the Hollywood animation powerhouses - in 2003 the superb Triplets of Belleville lost out to the universally loved Finding Nemo, and in 2009 The Secret of Kells was trumped by Disney/Pixar's Up - Brunner hopes 2014 will be his year for Oscar glory. Brunner will be taking Ernest & Celestine to the ceremony in a bid to beat Universal Pictures' box office smash Despicable Me 2, DreamWorks Animation's The Croods and Disney's Christmas offering Frozen. Ernest & Celestine is the story of a mouse and a bear who, in classic cartoon style, form an unlikely bond. Talking about taking on the computer animation giants with hand drawn techniques, Brunner told The Wall Street Journal's Speakeasy: "I feel like Tom Thumb, I'm an outsider". Brunner explained that unlike the major animation studios, only around 50 people worked on the production. He added that he felt lucky to have attracted big Hollywood names, including William H Macy, Lauren Bacall and Forest Whitaker, to voice the characters, and was just pleased to be in the race for a golden statue. Allez la France! In a similar vein to Beauty (above), Animation studio Breakthru Films is developing a project it hopes will be the world's first feature-length painted animation. Entitled Loving Vincent, the film will tell the life story of Dutch post-impressionist Vincent van Gogh by bringing his famous works to life through animation. Breakthru is best known for scooping the 2008 Best Short Animation Oscar for Peter and the Wolf. Funding for this next, much more ambitious project is still to be completed, but Breakthru Films founder Hugh Welchman believes the public are hungry for a more in-depth look at the man behind the masterpieces. Welchman says on the company's Kickstarter pitch: "I won it [the Oscar for Peter and the Wolf] thanks in large part to working with brilliant creative people. With Loving Vincent I have a similar recipe for success - the wonderful paintings and story of Vincent van Gogh, and the unique vision of [painter, animator and director] Darota Kobiela". It is estimated that the finished film will comprise of 56,800 individual works of art, recreated to mimic van Gogh's original masterpieces. 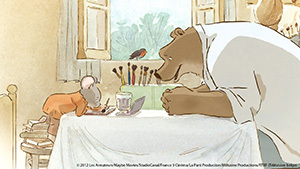 To make this possible, the studio has implemented what it’s calling PAWS - Painted Animation Work Stations - as a way of making the stop-motion process as efficient as possible. Pre-production will see a team of 40 painters put through a rigorous training programme on how to tell Van Gogh's story "by and through the paintings". Shot at a resolution of 8k, the oil paint on canvas animation technique is reminiscent of the works of Polish master Witold Giersz and Oscar winning Russian animator Petrov. Kobiela explains that she hopes the animation will shed some light on the mystery of van Gogh. "Why would someone with his passion for the world, for seeing it, for sharing it through his work take his own life? ", she asks. Animation explains American football "for liberals, ladies & Limeys"
There's no escaping the news that the US has just recovered from its annual bout of Super Bowl fever, but as so-called "Limeys", we have to admit we have no idea what all the fuss was about. Thankfully, award-winning UK-based writer, director and animator Fraser Davidson has come to our rescue in an attempt to explain the rules of American football and why the Super Bowl is the biggest sporting event on the planet. The informative but fun video uses simple fast-paced visuals combined with a quick fire tongue-in-cheek voiceover to explain the history, rules, league structure and other intricacies of a sport so universally worshipped by our American cousins. We're still not sure we understand exactly how the game works, but it's nice to know that winning the Super Bowl grants the athletes immortality, as well as a brand-new pickup truck. The title track of Damon Albarn's upcoming solo album has been accompanied by a rather kooky animation of the musician's digital facial reconstruction. Visual designer and artist Aitor Throup has taken the mournful song Everyday Robots and given it the full CSI treatment with a computer-animated sequence of the Gorrilaz singer's head quite literally coming together from the skull out. The video for the titular single was created with ZBrush, a CGI programme used by Hollywood and the gaming industry to create accurate 3D images of living people. Throup explained that it was not the finished digitisation of Damon's head that he thought music fans would find enthralling, but rather the complex process needed to reconstruct his features. "I was more interested in the process that the programme offered than the eventual result. So that's what we've captured - we've screen captured an authentic digital sculpting process that wouldn't normally be seen as an animation. It's not an animation as such, it's just captured process", Throup told Creative Review. The final result fits perfectly with the melancholy vocals, classical strings and folky percussion - and, perhaps for the first time, gives us a literal insight into the inner workings of Damon's head. And finally... a simply superb super-short animation from Frozen and Wreck It Ralph supervising animator Wayne Unten somehow caught our eye this week. The blink-and-you'll-miss-it six-second piece features an animated Olivia Wright (the first to pilot the great grasshoppers of North America) leaping onto the back of a live grasshopper, snapping on her goggles and disappearing with a single hop into the blurred distance. Unten said he did not want to resort to rotoscoping (as it is no fun!) and instead utilised TV Paint animation software to create this mini masterpiece. He explained that the live action footage of the grasshopper was captured on his iPhone during a visit to the playground with his kids. This celebration of The Golden Age of Insect Aviation: The Great Grasshoppers is sure to have you clicking the play button more than once.